William L. Hawkins was a self-taught artist who created an astonishing body of vibrant, colorful, and large-scale paintings late in life, executed in a highly personal style. Hawkins incorporated collage and assemblage of found objects to create work meant to both shock and delight viewers. His cityscapes often portrayed buildings in his beloved town of Columbus, Ohio. He also vividly portrayed historical events, religious subjects, and animals in his unique and joyous style. The Figge Art Museum in Davenport has organized a show entitled "William L. Hawkins – An Imaginative Geography", which includes 52 of Hawkins' paintings as well as drawings and a rare, large-scale sculptural assemblage. 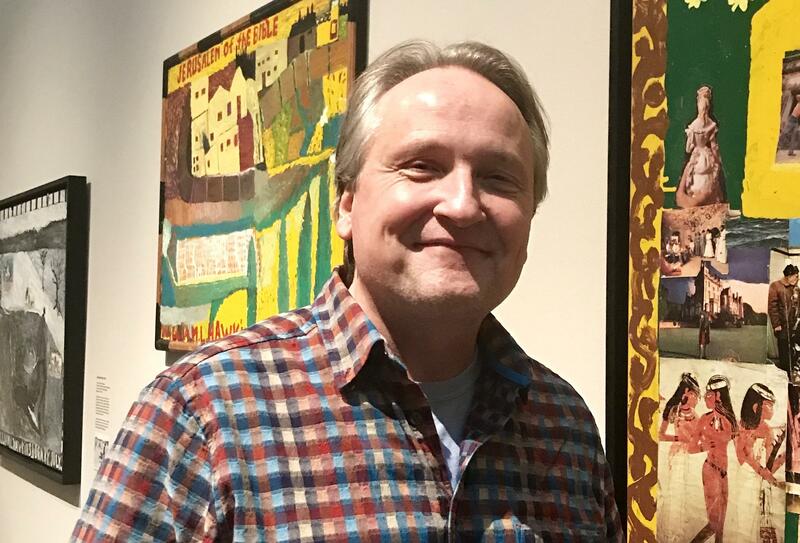 Listen here to our conversation with Andrew Wallace, Director of Collections and Exhibitions at the Figge, about Hawkins' life, his painting style, and the complexities of organizing a traveling exhibition of this size and caliber. The show will be up through Dec. 30, 2018, on the 4th floor of the museum, located at 225 W. 2nd Street in Davenport. Additional pieces—including his large-scale assemblage—are displayed on the first-floor foyer. There is a free family day scheduled for Saturday, Nov. 17, 2018, and the Figge also offers free admission every Thursday evening from 5:00 to 9:00 p.m. While you are there, check out the beautiful and fully illustrated 192-page catalogue with essays by independent curator Susan M. Crawley, Jenifer P. Borum, Curlee R. Holton, and others. The catalogue can be purchased at the museum store.